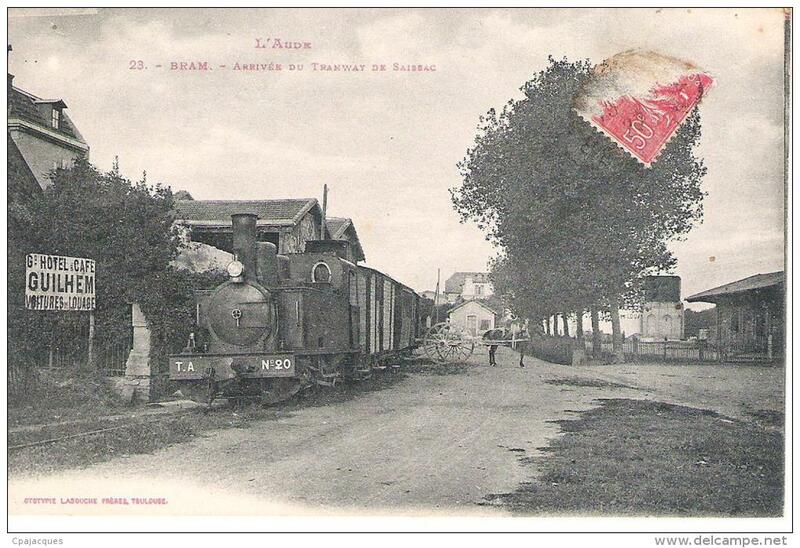 The next most westerly of the Tramways de l’Aude lines was that from Fanjeaux running north through Bram to Saissac and then east to Saint Denis. This is a journey along the route of that line seeking to find any possible remaining evidence of its existence. 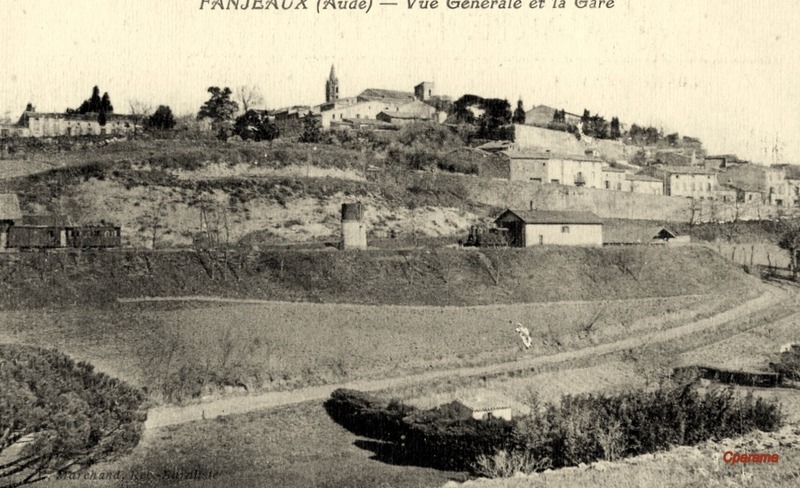 Fanjeaux is an important Cathar site. It was a major centre, and in the 13th Century was a significant citadel with a population of over 3,000. It was then surrounded by a moat and defended by ramparts with fourteen towers (tours). Two entries serve as reminders of the medieval gates which controlled entry into the town. Like most Languedoc castra it had a large castle (Château) within its walls. Almost nothing of it remains today. 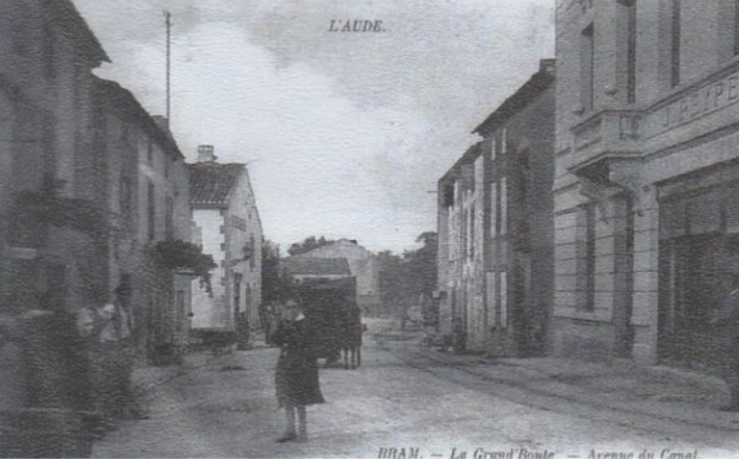 Bram is part of the old province of Lauragais. It was a centre of Cathar belief and that heresy brought the intervention of Simon de Montfort who, besieged the town in 1210. He succeeded in three days and took revenge on resistants by cutting off the top lip of all his prisoners and gouging out the eyes of all but one. For the last he gouged out only one eye so that he could lead the others out of the town to the château of Lastours. The Château de Saissac is a ruined Cathar Castle on a promontory at the southernmost tip of the commune of Saissac, in the Aude département located north-west of Carcassonne. 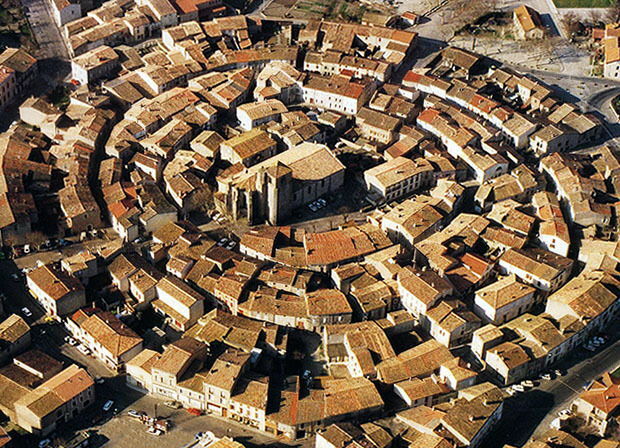 Saint Denis is a village of less than 500 people. It is located in the foothills of the Black Mountains between the valleys of Alzeau in the west and Linon in the east. It is a little to the east of Saissac. The station facilities focussed more on goods than on passengers. The goods shed features clearly in the adjacent picture with the water tower and engine shed beyond. The second image is taken from a distance showing the station in its place beneath the town. It shows even more clearly just how far apart the various facilities were. On 6th September 2018, my wife and I walked the route marked in red above. I took a number of pictures as we walked around the village. A few will suffice here to give an impression of the current state of the old tramway route. 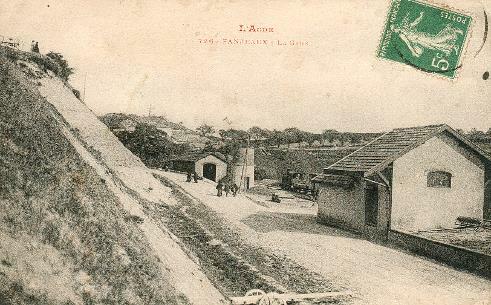 The first evidence of the tramway to the east of Fanjeaux is the slip road approaching the roundabout at Prouilhe. The slip-road follows the old tramway formation. 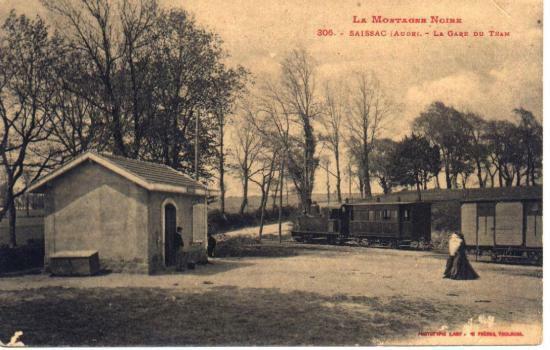 Prouilhe was the first halt on the tramway beyond Fanjeaux. 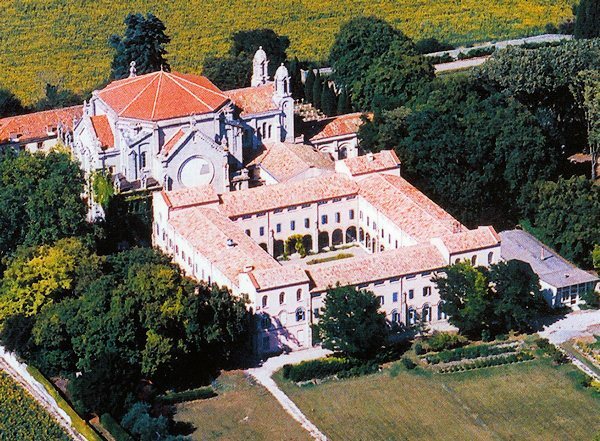 Its claim to fame was that it was the location of the mother-house of the Dominican order, ‘Notre-Dame des Prêcheurs’. 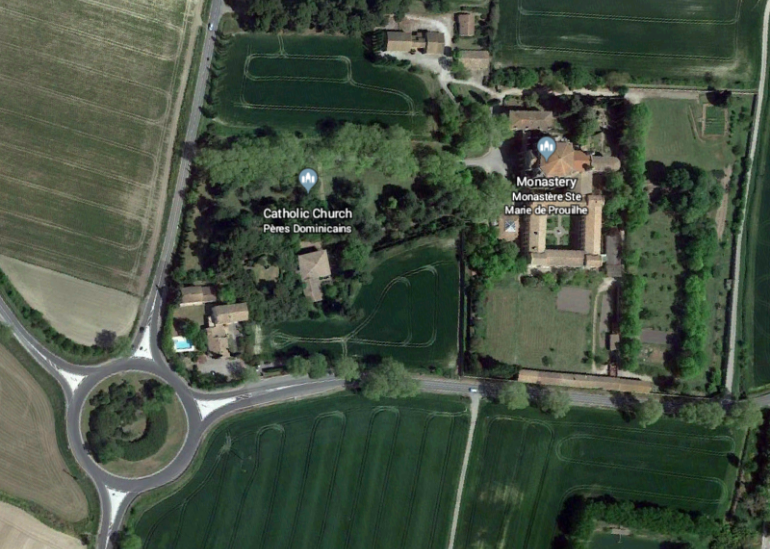 Evidence of the tramway halt is nonexistent but the monastery and the Covent buildings attached to it are still very much present. From Prouilhe, the tramway continued northeast towards Bram alongside what is now the D4. It passed through Taurines and Villesiscle on the way. 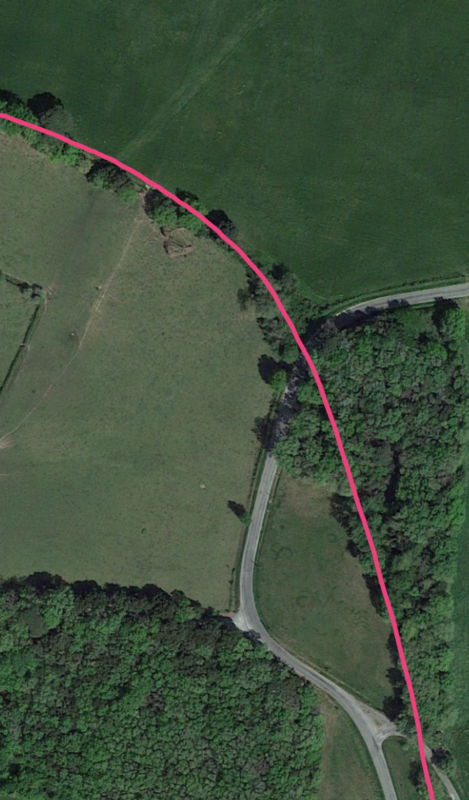 There are long straight sections of single- carriageway road with no evidence of the old tramway. The station area at Villesiscle is still a flat open space with little indication of its use as a tramway station in the past. Perhaps clutching at straws here, but the alignment of the boundary fence to the memorial garden suggests that the tramway album alignment dictated its location back from the road. Heading out of Villesiscle thev D4 approaches the modern motorway. 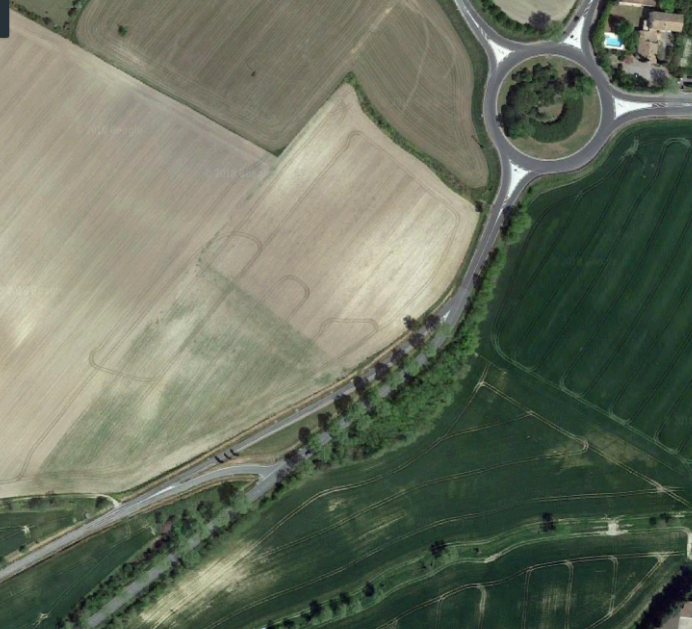 The road was diverted to bridge the motorway and the old road alignment is still visible and not surfaced. It s possibly a good example of what the road might have been like when the tramway was in use? 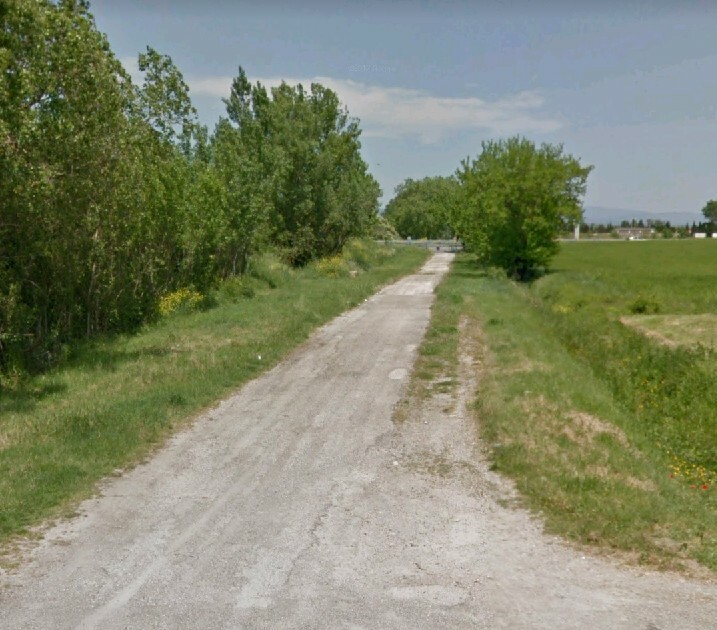 The old road into Bram. The motorway which crossed it can just be seen in the far distance. 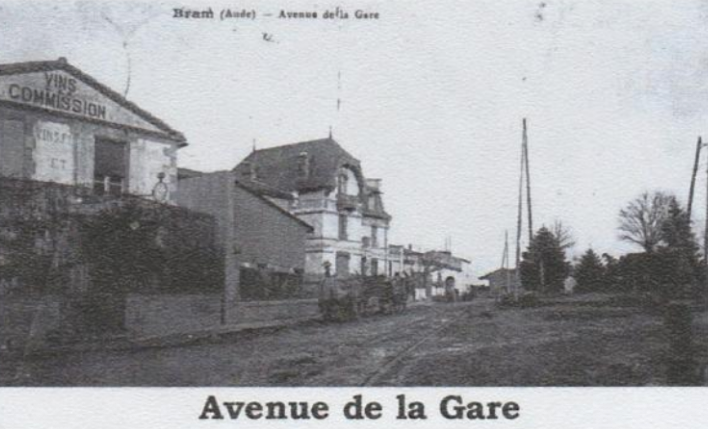 The tramway entered Bram along what is now Avenue Georges Clemenceau and Avenue du General de Galle. 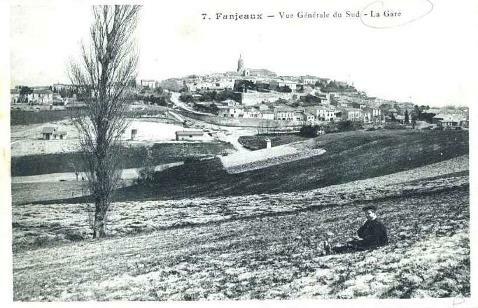 In those days, ‘Route de Fanjeaux’. 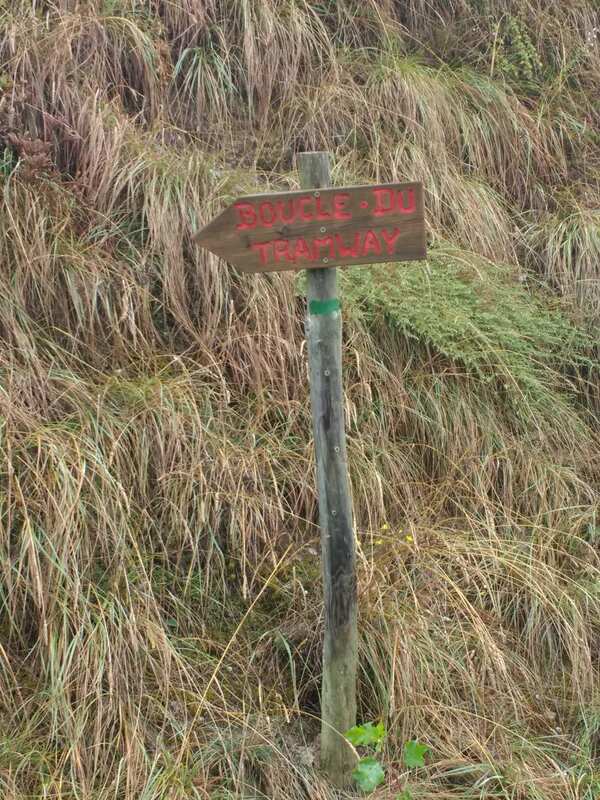 Bram, Route de Fanjeaux. The tramway tracks are just visible on the left. The view from almost the same location in 21st Century. The overall shed roof is now missing in the 21st Century. The tramway buildings and lines are long-gone. Returning to the tracks which headed north out of Bram, we cross the level crossing and head out of town. At this point the tramway was on the east (right) side of the road. 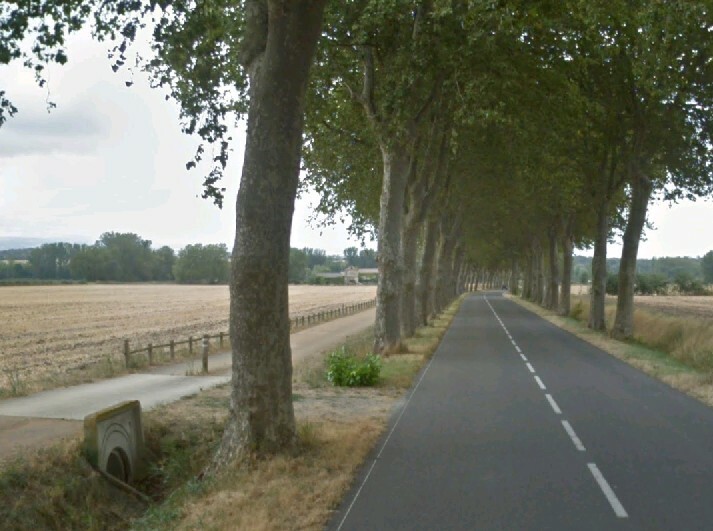 As we leave Bram behind the road is flanked by an avenue of plane trees. As we approach them, I imagine, without much supporting evidence, that the tramway switches from the East to the West side of the road. If this proves to be incorrect, please forgive the excessive use of my imagination! 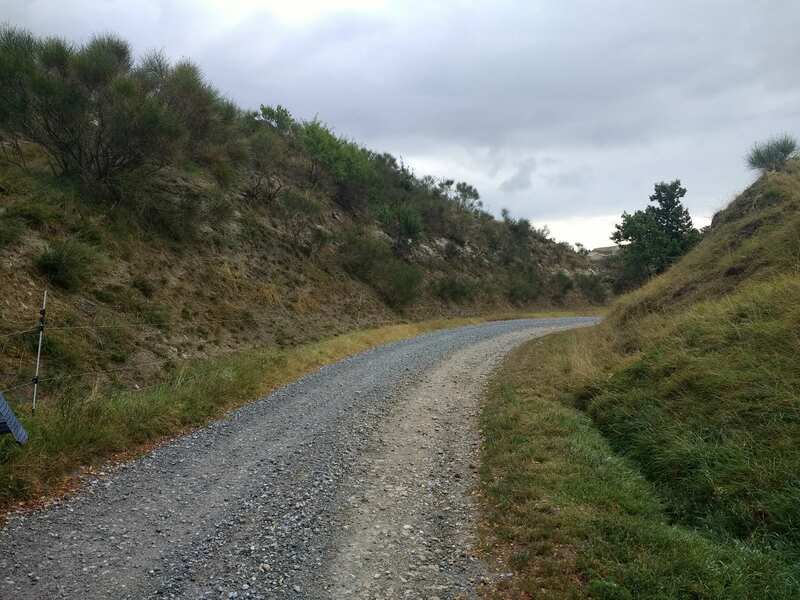 The cycleway on the left, on the West side of the road, may be on the formation of the old tramway. 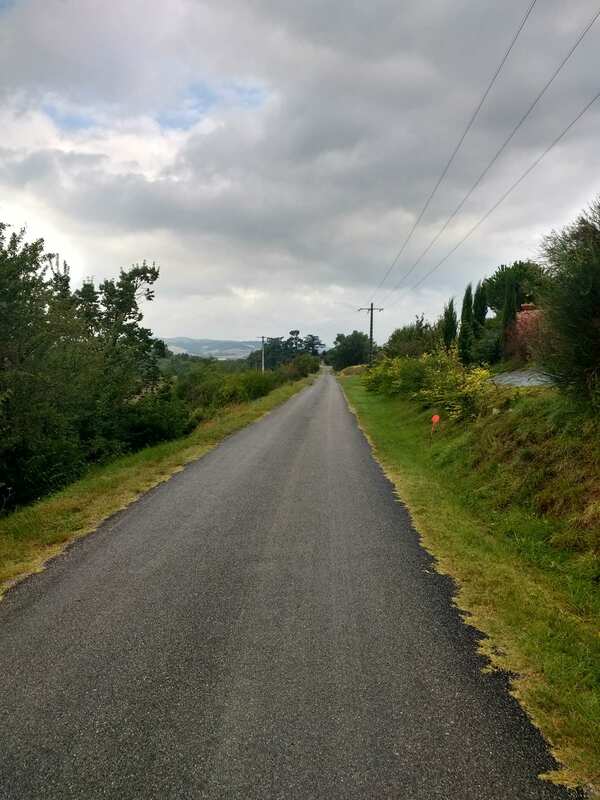 We are heading for Saissac, and as the journey continues we pass through a series of different stops – Montplaisir-la-Leude, St-Martin-le-Vieil, Cennes-Monesties, and Cap-de-Port. We also cross the Canal du Midi. We cross the canal just north of Bram. The tramway continues North. 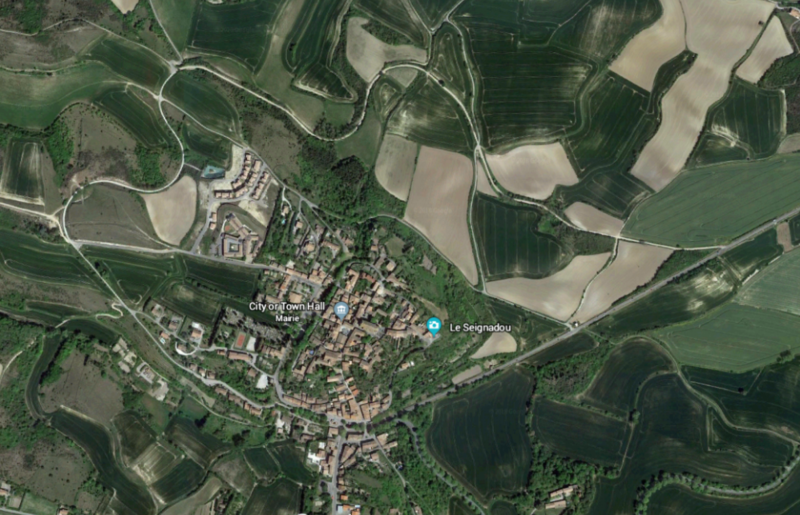 The countryside north of the Canal due Midi is relatively flat and it ius likely that the route chosen for the tramway was dictated by the desires and dictates of various landowners. The tramway ran on the western shoulder of what is now the D4. The road seems to have been designed to work with the tram. Long straight sections are punctuated by relatively smooth and generous bends. 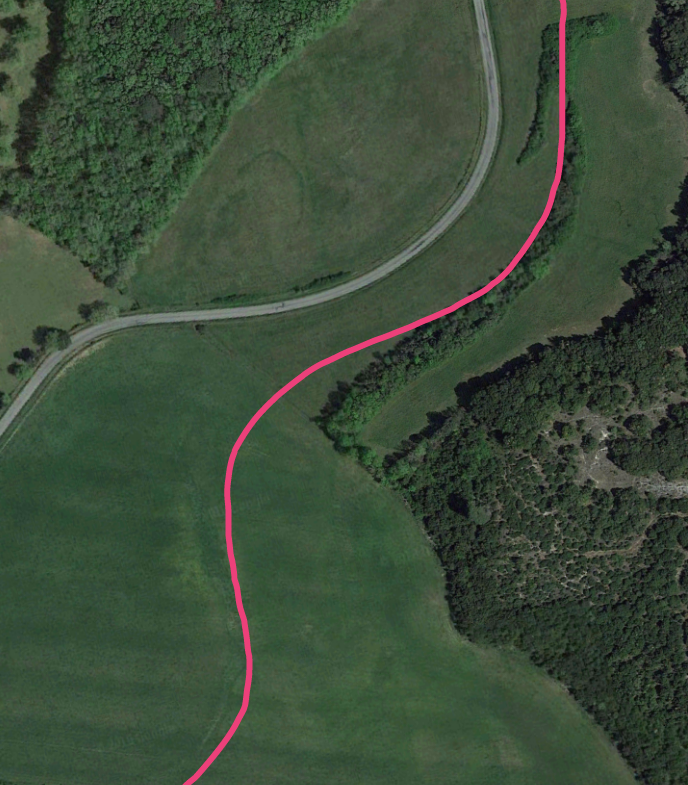 This OpenStreetMap excerpt shows the route. The Canal is visible in the bottom left of the image. 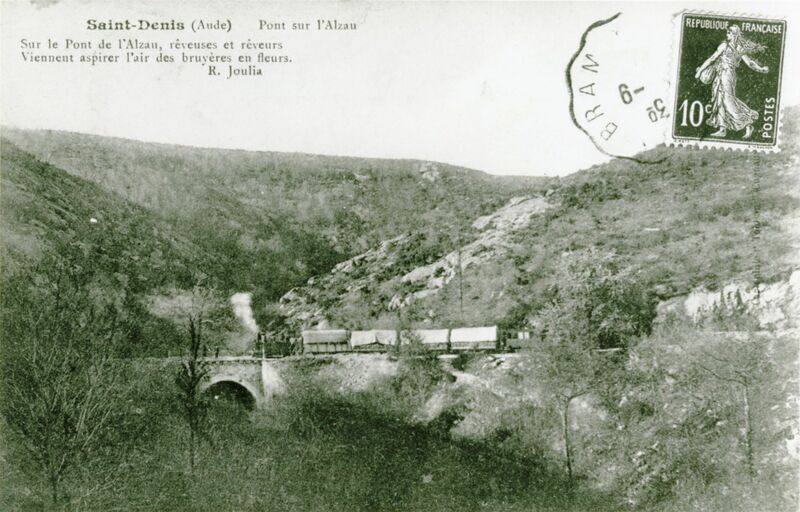 The tramway and GC116 (D4) then crossed the River Fresquel and the present D6113. 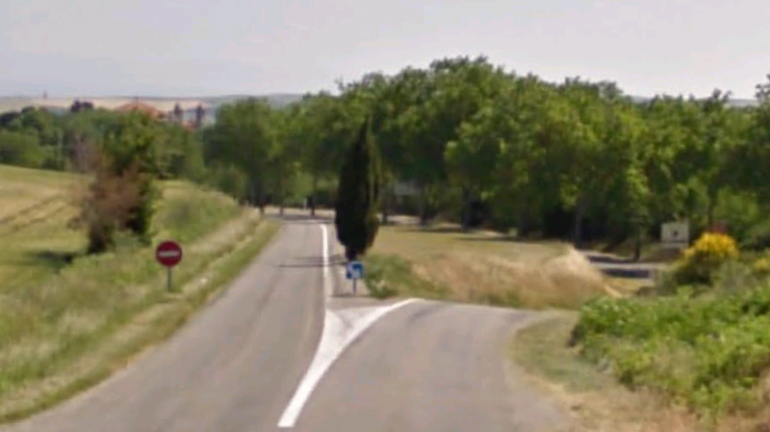 The first halt north of Bram was at this junction – Montplaisir-la-Leude. North of the River Tenten the tramway/road diverted around the edge of a field before heading for St-Martin-le-Vieil. 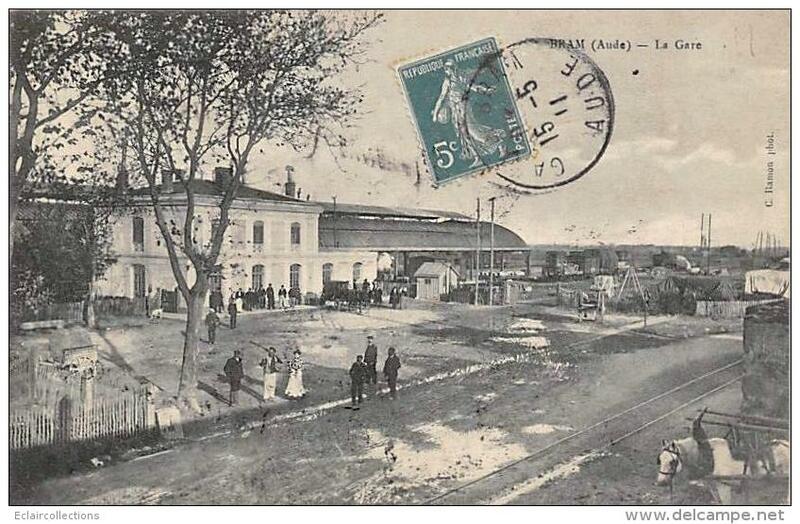 Things changed as the tramway reached its next stop in St-Martin-le-Vieil. This was the main village in Canton immediately North of the Canton of Bram. 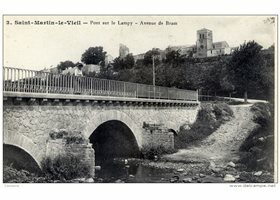 To access the village the tramway/road crossed the River Lampy on an ancient masonry arch bridge. 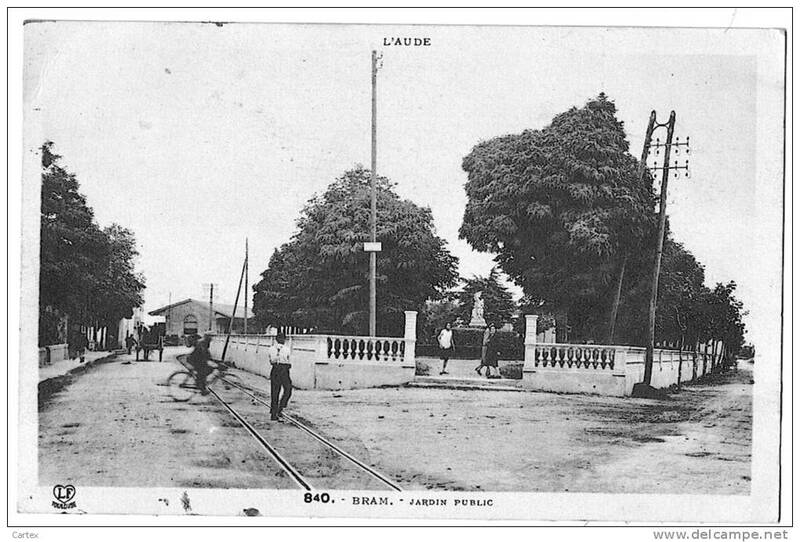 The picture below is not of the highest resolution but sows the bridge early in the 20th century, perhaps while the tramway was still working. 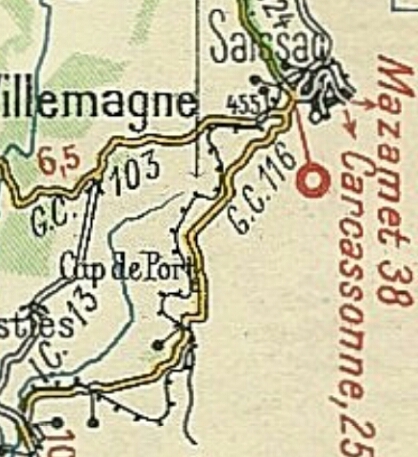 The adjacent 1930s Michelin map shows the tramway crossing the Lampy on a separate bridge to the road. 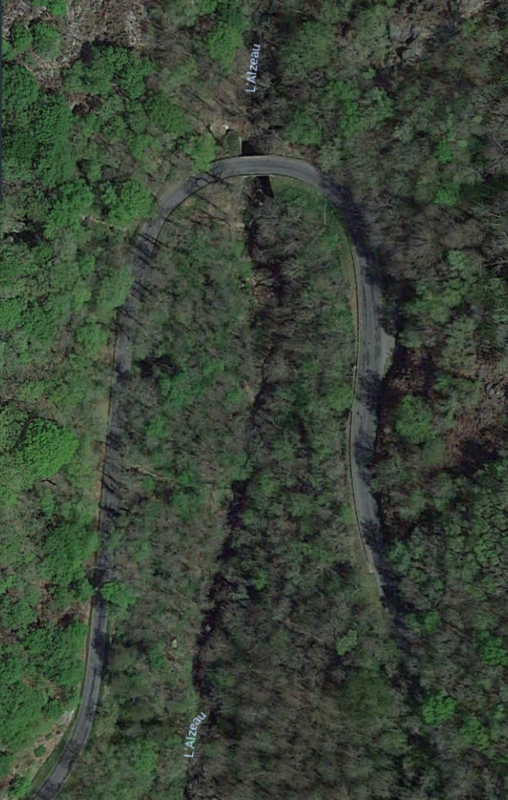 The lie of the land and the road alignment suggest that this is very unlikely. 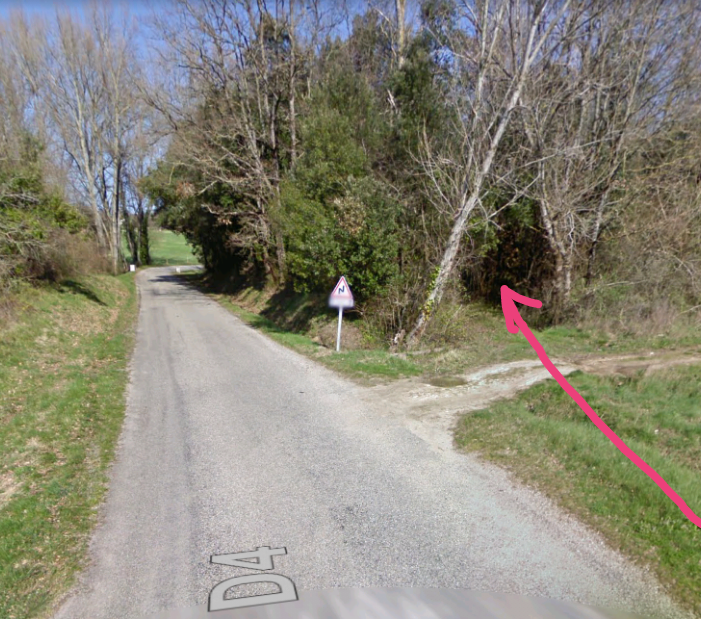 No evidence exists to suggest that the tramway diverged from the road over this length. The bridge is just visible in this modern view of the village. 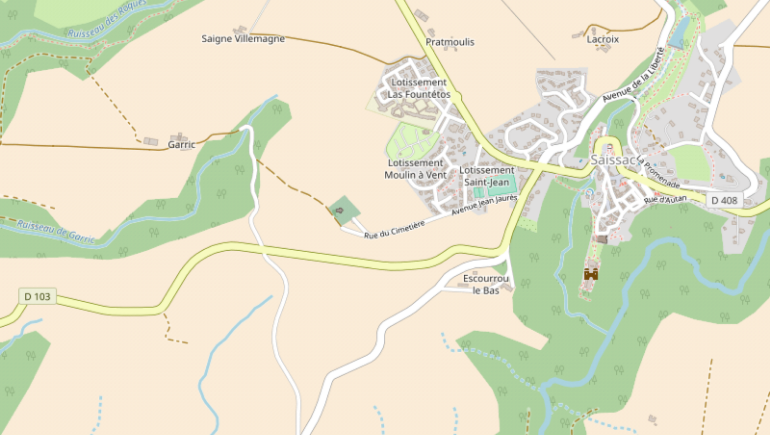 St-Martin-le-Vieil is a historic Cathar site with three significant elements: the castle; the church and the abbey; and a series of caves excavated by hand in the 9th Century. Its origins go back to the 8th century. The tramway ran along the GC116 (D4) through the village and continued alongside the road and river until close to Cennes-Monesties. 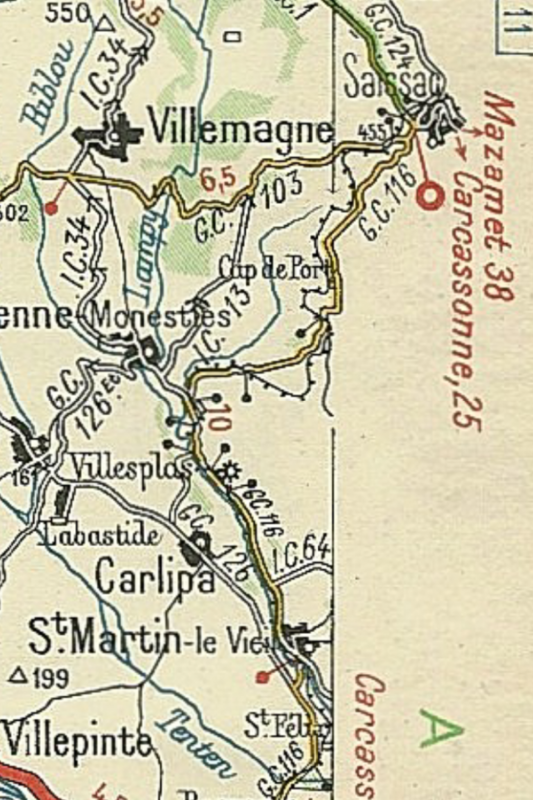 The road to Cennes-Monesties diverges to the left. The tramway continued to the right still following the shoulder of the GC116(D4). 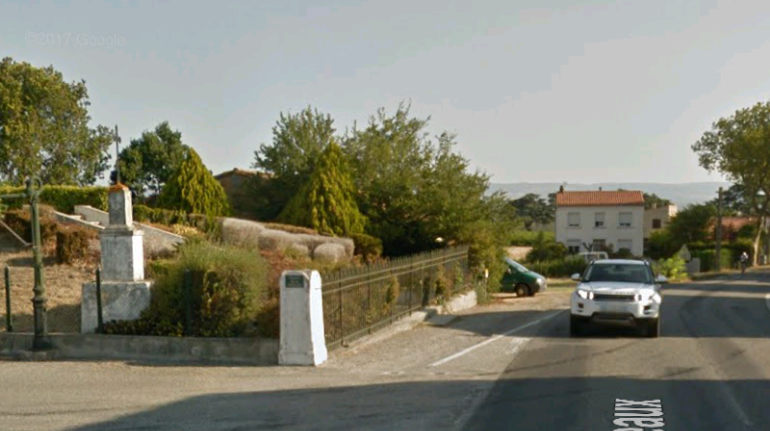 There was a halt at this location for Cennes-Monesties. I have been unable to find any details. 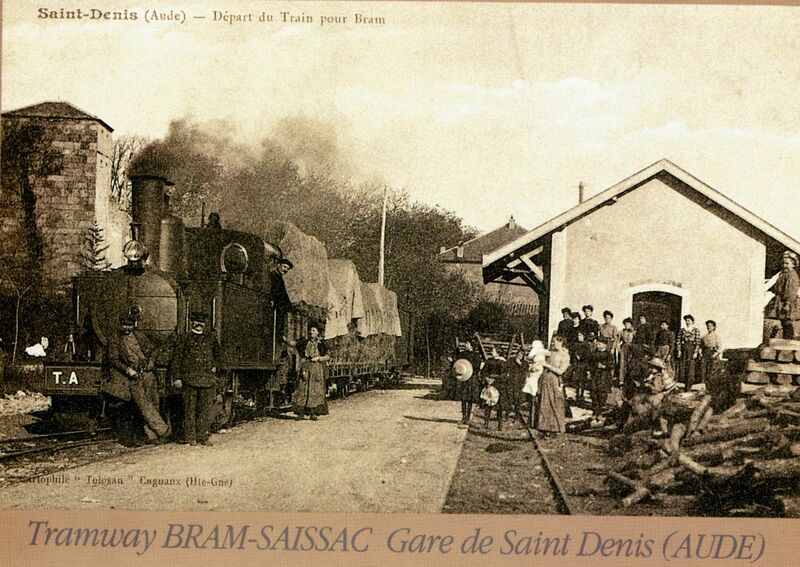 For most of its length the Saint-Denis/Saissac line followed the route of the existing roads, but because of the road gradients, 8 kilometres separate lines were created. 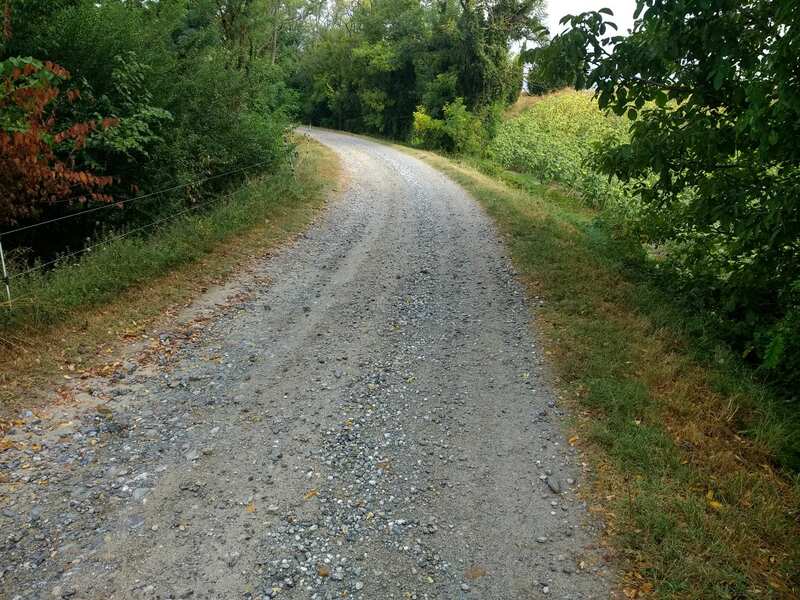 These next few paragraphs and photographs trace the line as it meanders away from the road over the length between Cennes-Monesties and Saissac. The first deviation is significant both in direction and length, leaving the road for some distance to the south before swinging round to the north and then following the road, but at a distance to the East as far as the next highway junction. The satellite images below confirm the route which appears only as alteration to the color of the ground or crops along its length. At points it is impossible to verify the line but those parts which can be established indicate the route elsewhere. The tramway leaves the shoulder of the road at this point. The tunnel through the undergrowth marks its most probable line. From this point it curves away to the south. The tramway swings away from the road through shrub-land. Its route is approximately marked by a line of taller trees. 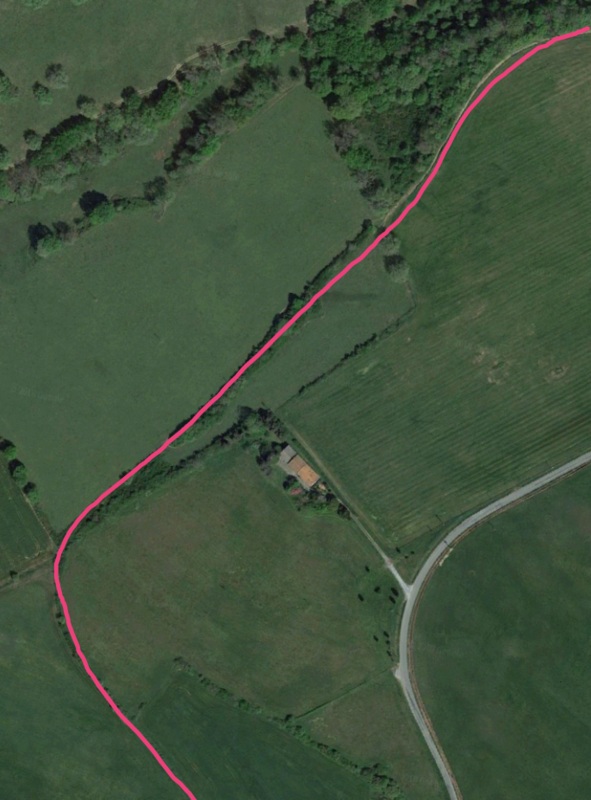 Once arable land is reach the route of the tramway shows on the satellite image as a wide curve as marked by the pink line. The pink line is only approximate. 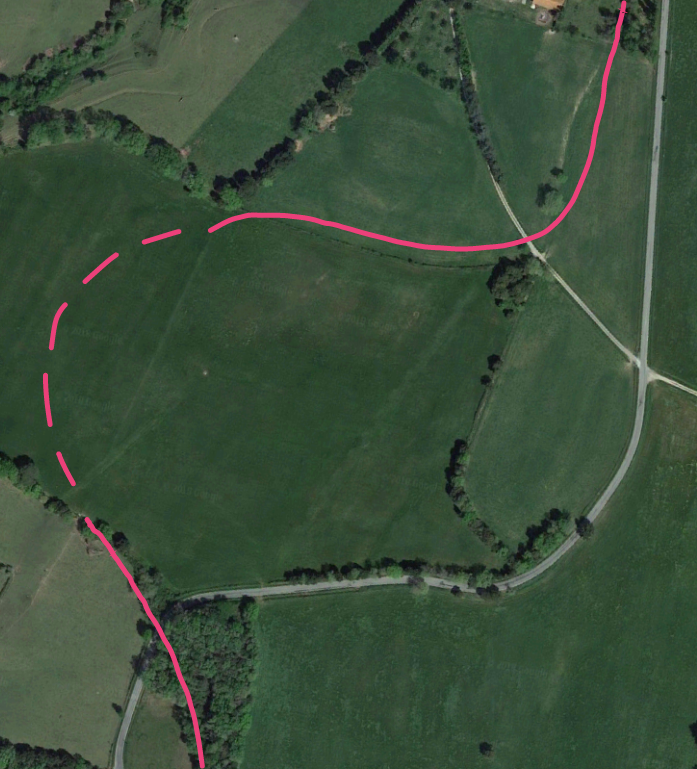 In the image above, from the route through the open field the line curves back again towards the East and follows the edge of the elongated copse of trees in the field. In the adjacent image the north end of we features at the bottom of the picture. 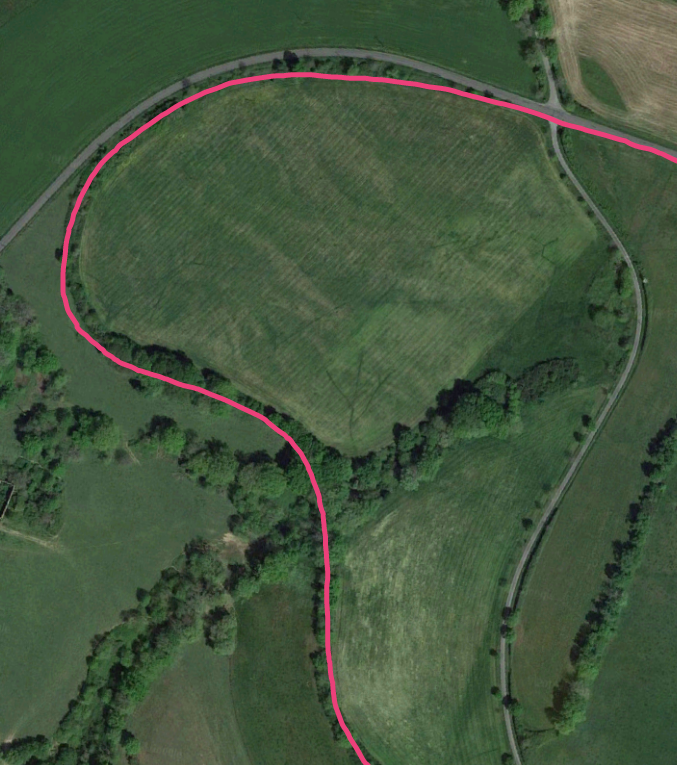 The line of the tramway snakes through the open field towards the point at which the two roads in the image meet. The route is most clear at the top of the picture. A small copse appears at the top of this picture. 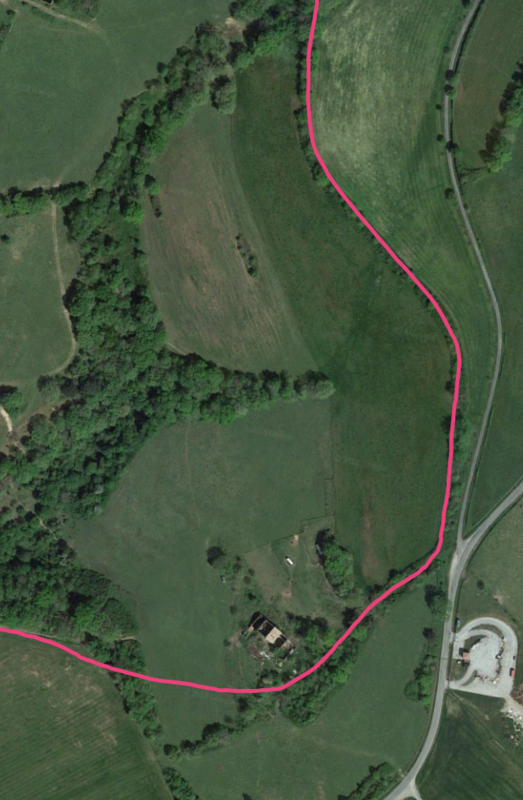 It becomes a much larger copse to the north of the side road as can be seen on the next picture. The route of the tramway crosses the D4 at a point where the road bends eastward. 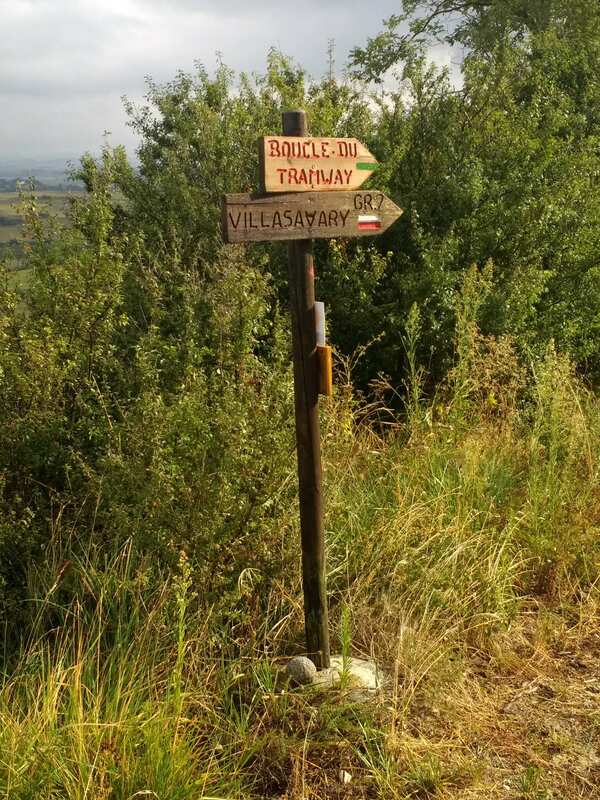 It is difficult to identify the point at which the tramway began to turn back eastward. One possible location, suggested by some marks in the field to the north, is approximately where the first lighter free trees are to the northwest of the D4. I cannot be sure.. 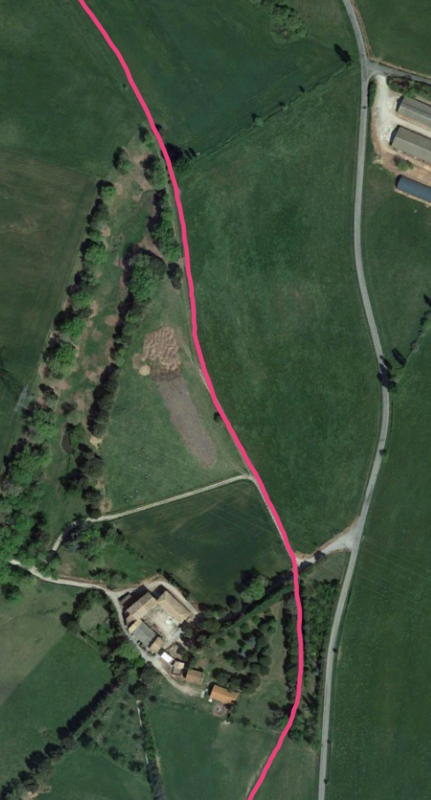 However, the alignment to the north side of that field, as the tramway returned towards the D4, is clear. 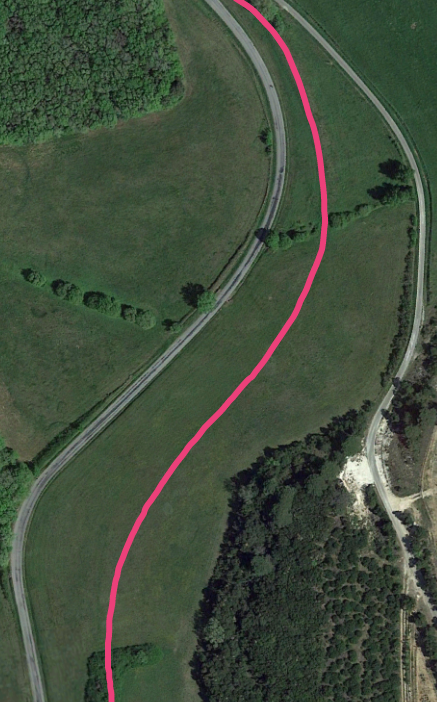 The pink line is again only approximate and the actual alignment can be made out crossing the field and turning north. 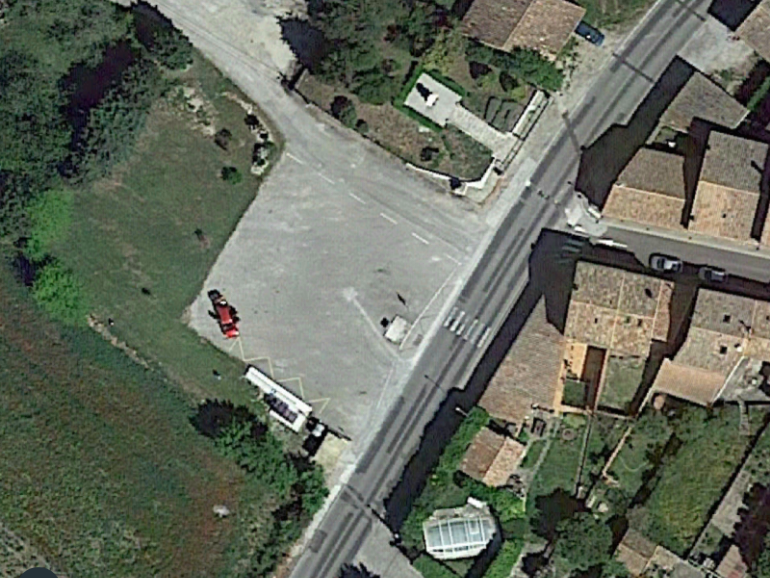 The next halt at Cap-de-Port was adjacent to the building in the bottom right of the next image, not far from the road. The tramway continued north a distance west of the modern D4. It turned this way and that, seemingly mirroring the changes in direction of the road until, at another junction with a minor road, it struck off away from the present D4 (GC116) and curved round to run along the shoulder of the GC103 (the modern D103). 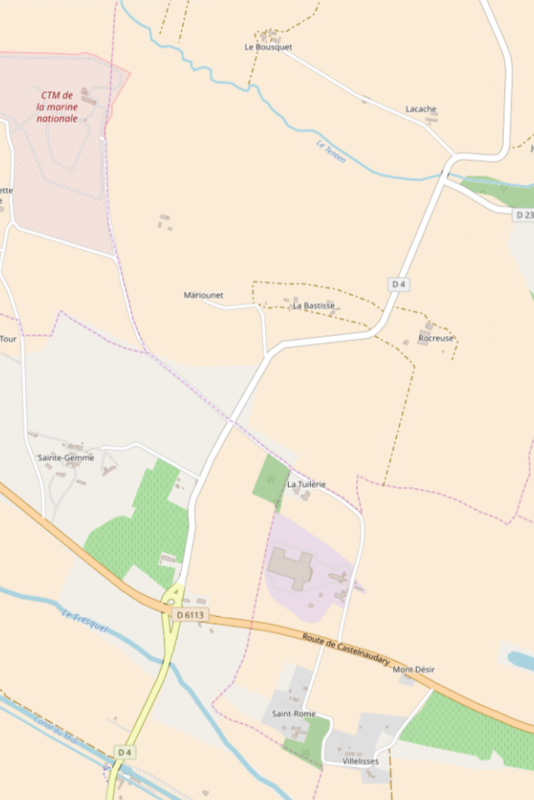 The OpenStreetMap plan below shows the route of the D103 (and therefore the route of the tramway) into Saissac. 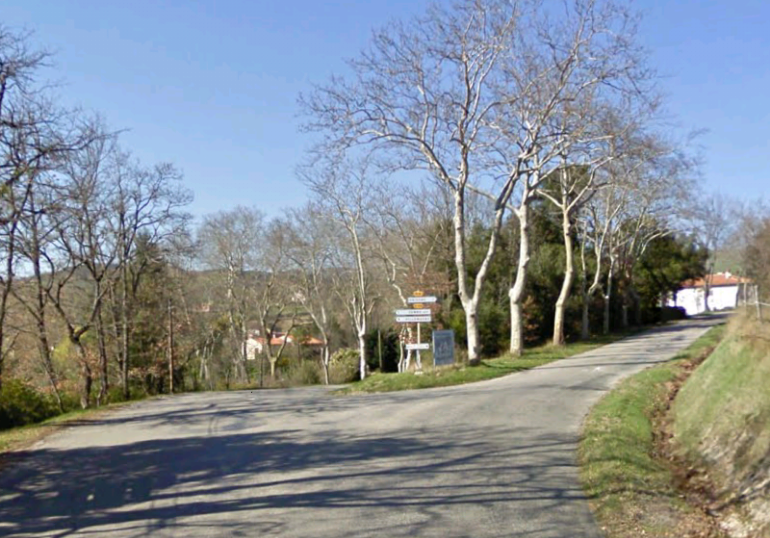 Its route out of Saissac is along the D408. The route of the tramway through Saissac is well preserved as a street – the Allee de la Promenade. 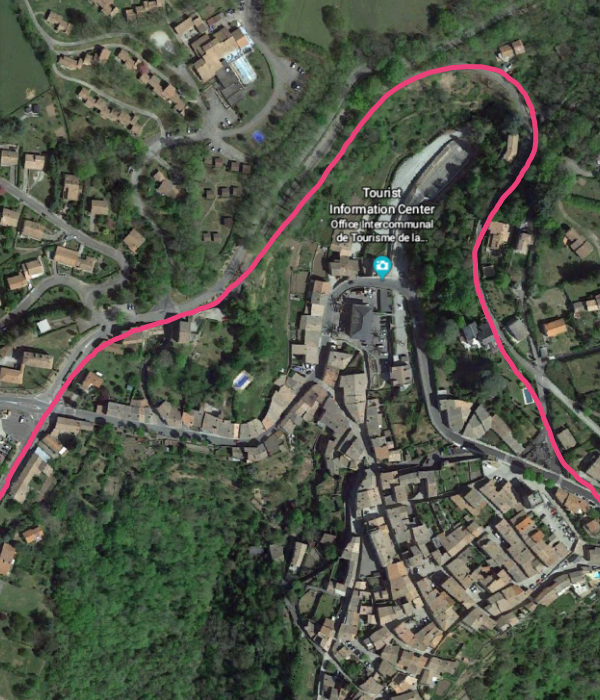 The route is again shown in pink on the adjacent satellite image of the town. 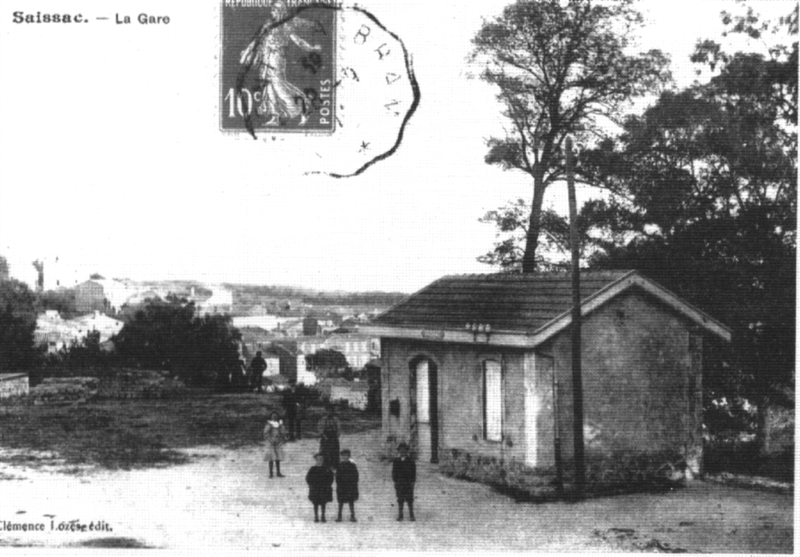 The route closer into the town is called the Avenue Georges Clemenceau. 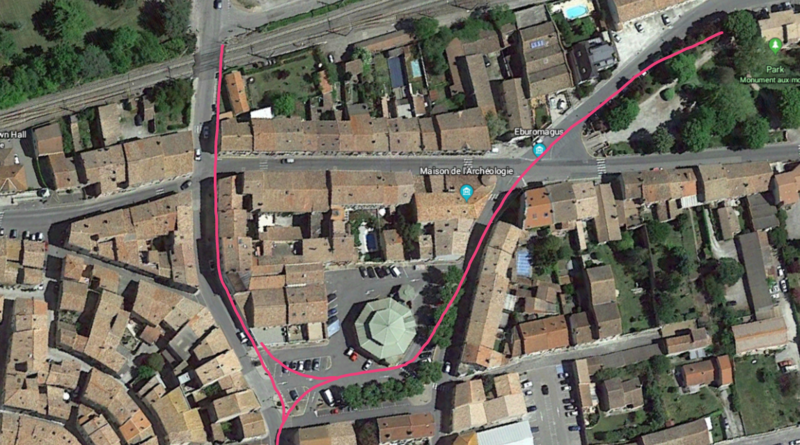 It was not suitable as the tramway roue because of the narrowness of the street on the west side of the town and the steep drop, west to east, into the town and then the climb, west to east out of the town-centre. 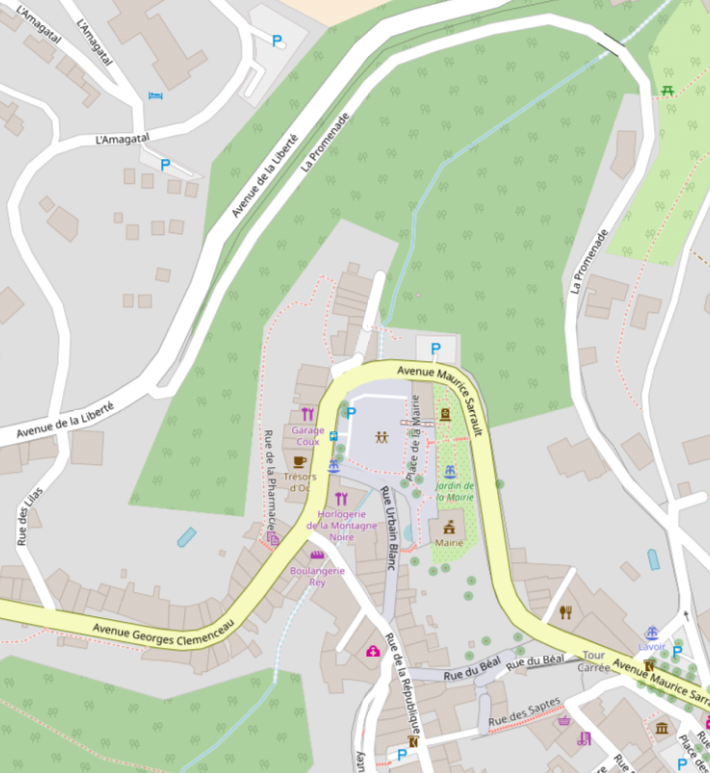 The Allee de la Promenade is shown on the OpenStreetMap plan below. 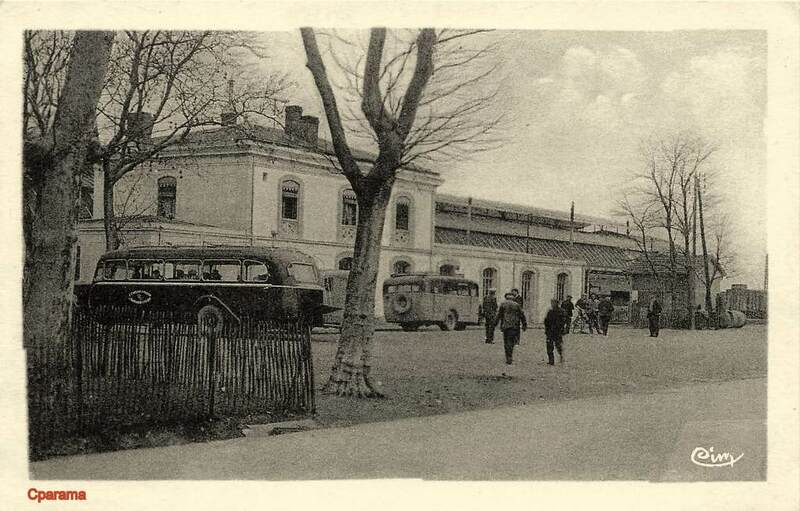 Two postcard images of the station are immediately below. 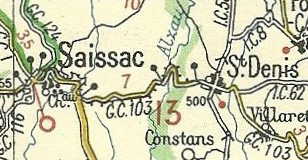 The tramway route leaves Saissac on what is now the D408. It was once the GC103. The final leg of the journey to Saint-Denis is short – just 5 or 6 kilometres. Initially the tramway ran on the southern shoulder of the road. It then crossed to the northern side just before entering the valley of l’Alzeau and remained there until reaching Saint-Denis. The bridge in the two postcard views above, taken in the early 21st Century looking back towards Saissac. Looking forward from the bridge, the old tramway formation can be seen on the left. 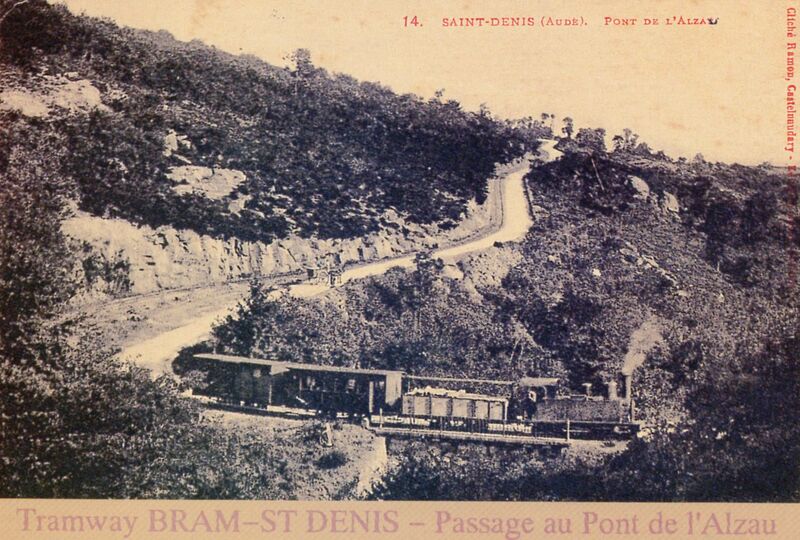 Very soon after leaving the valley of l’Alzeau the tramway entered Saint-Denis. 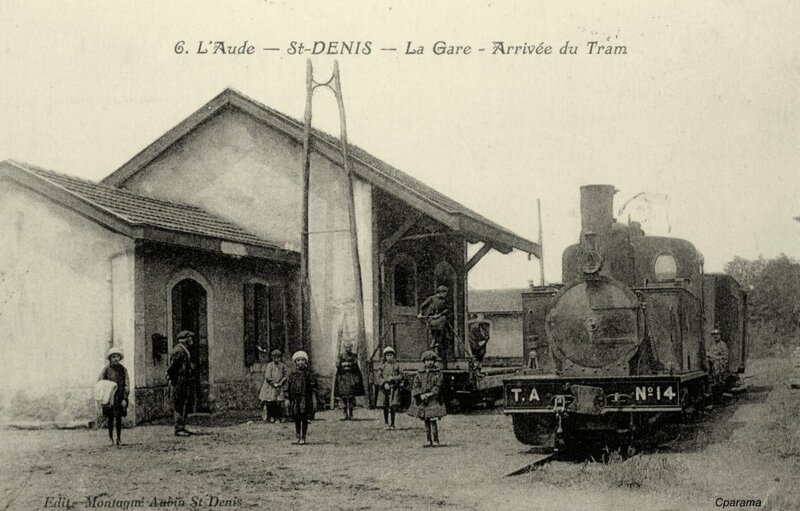 The remaining pictures in this post show the station at Saint-Denis. The final picture shows the location of the station in the 21st Century. The site has private dwellings built on it. The main identifying factor is the church tower which appears on the first postcard above. 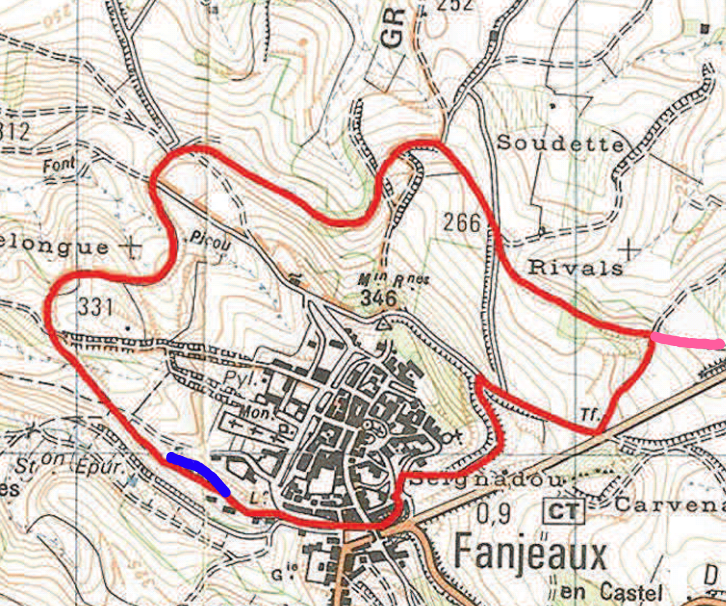 1. https://en.m.wikipedia.org/wiki/Fanjeaux, accessed on 2nd September 2018. 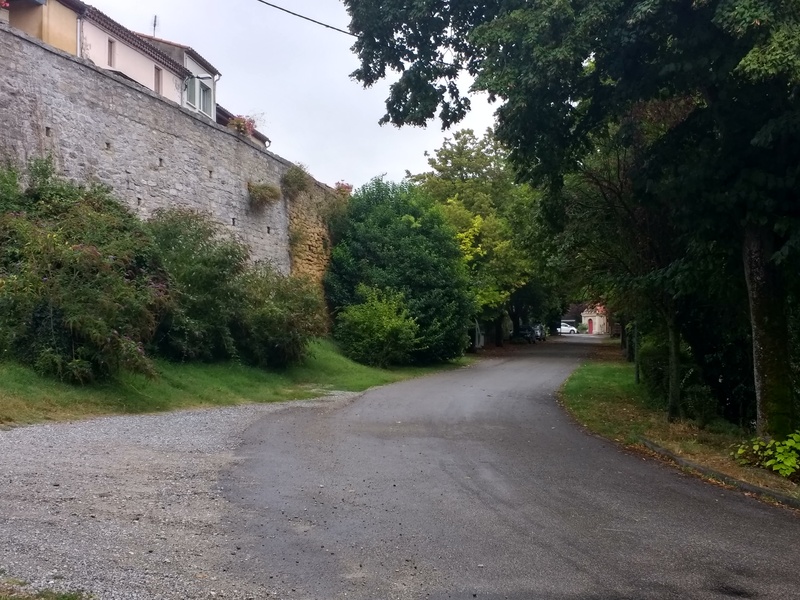 2. http://m.audetourisme.com/diffusio/en/activities/culture-and-heritage/fanjeaux/the-citadel-of-fanjeaux_TFOPCULAR0110000004.php, accessed on 2nd September 2018. 3. http://www.catharcastles.info/fanjeaux.php, accessed on 2nd September 2018. 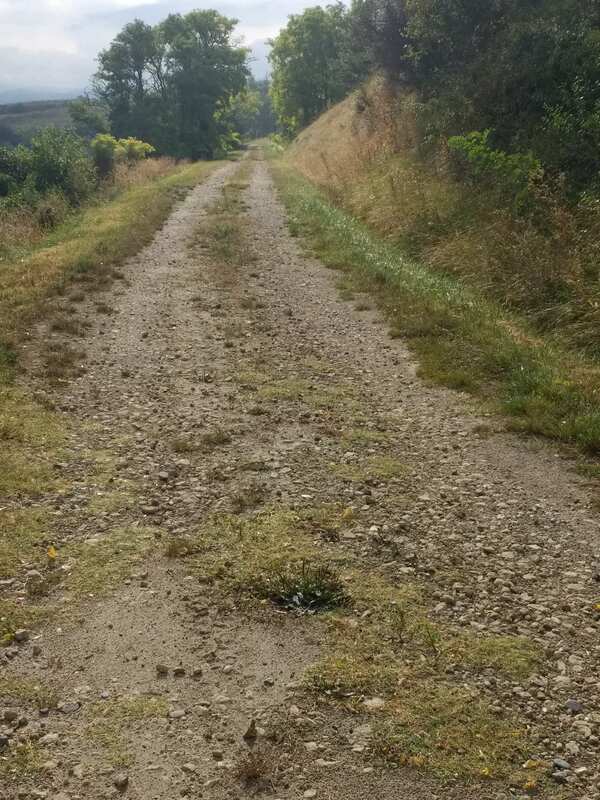 4. https://www.lindependant.fr/2011/06/26/fanjeaux-sur-le-chemin-de-l-ancien-tramway,35014.php, accessed on 2nd September 2018. 5. http://www.cpaaude.fr/THEMES/TRAMWAYS/index_fichiers/Page1575.htm, accessed on 2nd September 2018. 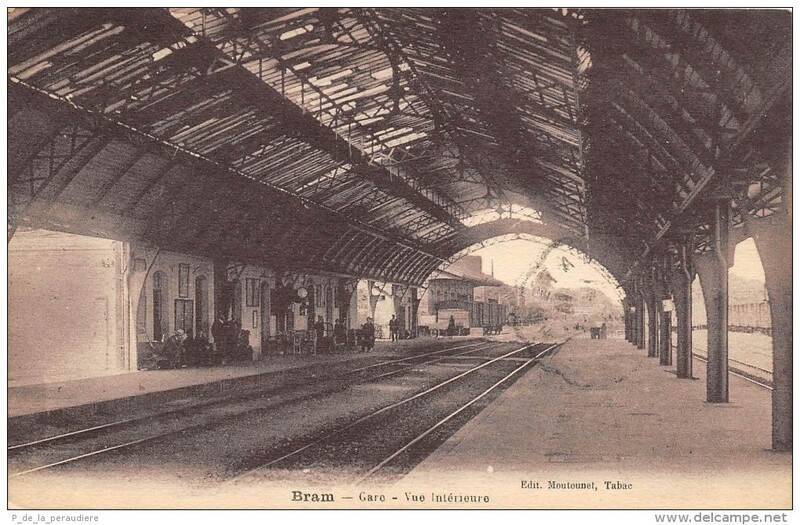 6. https://www.delcampe.net/fr/collections/cartes-postales/france/bram/cpa-11-bram-la-gare-les-voies-les-quais-483494836.html, accessed on 3rd September 2018. 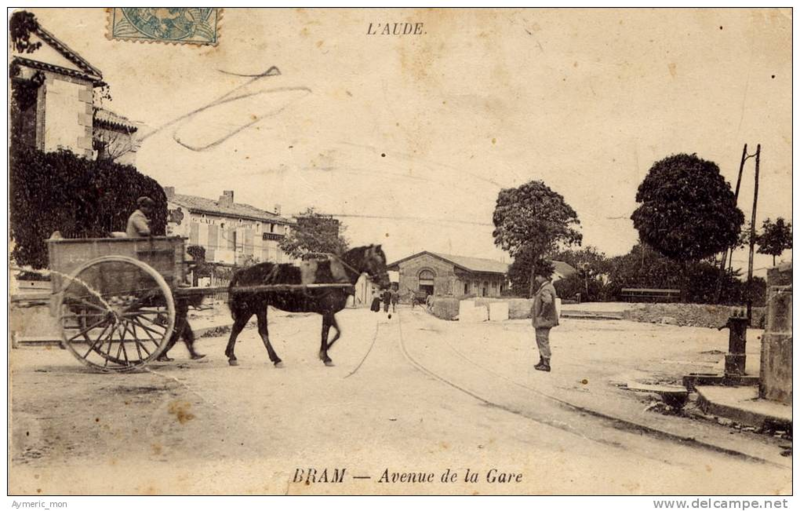 7. https://www.delcampe.net/fr/collections/cartes-postales/france/bram/11-bram-la-barriere-avenue-de-st-denis-485091341.html accessed on 3rd September 2018. 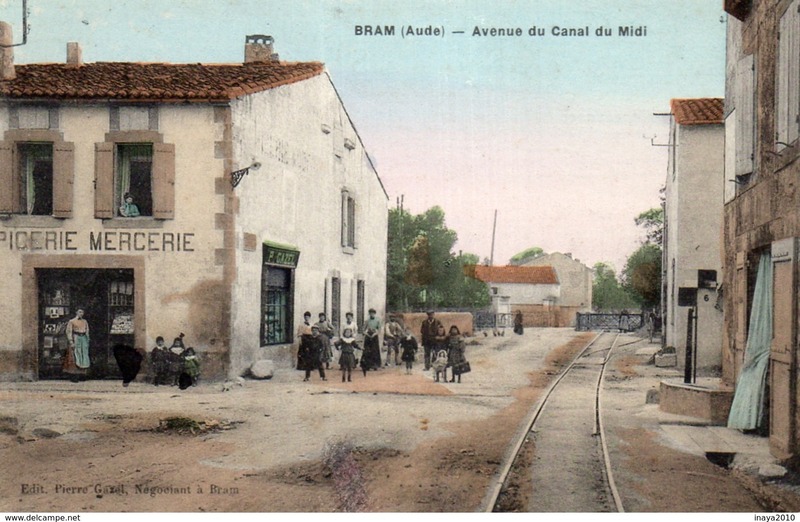 8. https://www.delcampe.net/fr/cartes-postales/europe/france/11-aude/bram, accessed on 3rd September 2018. 9. https://www.cparama.com/forum/bram-t193.html, accessed on 3rd September 2018. 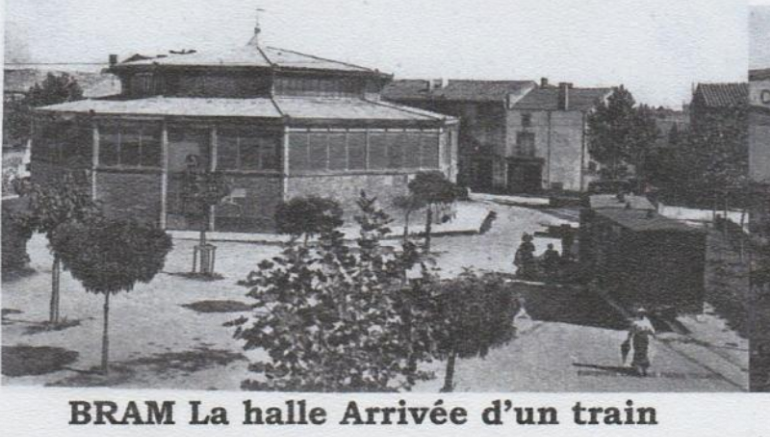 10. http://saissac.e-monsite.com/pages/la-ligne-de-tramway-de-bram-a-st-denis.html, accessed on 3rd September 2018. 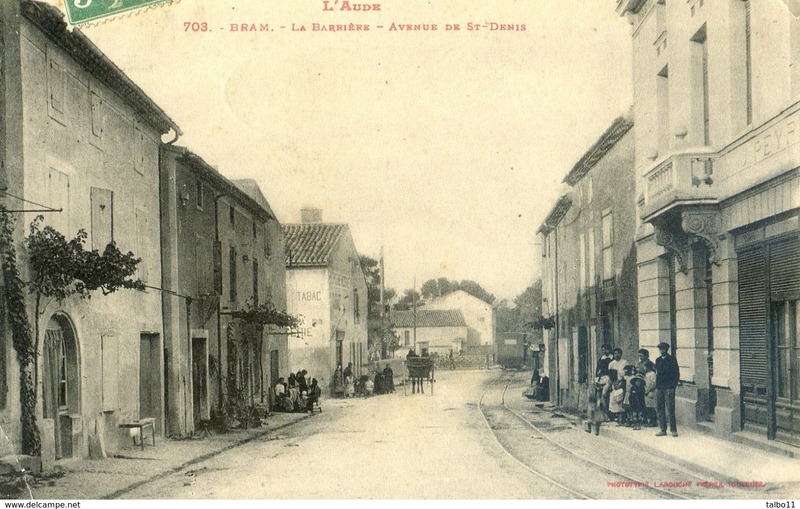 11. https://en.m.wikipedia.org/wiki/Bram,_Aude, accessed on 3rd September 2018. 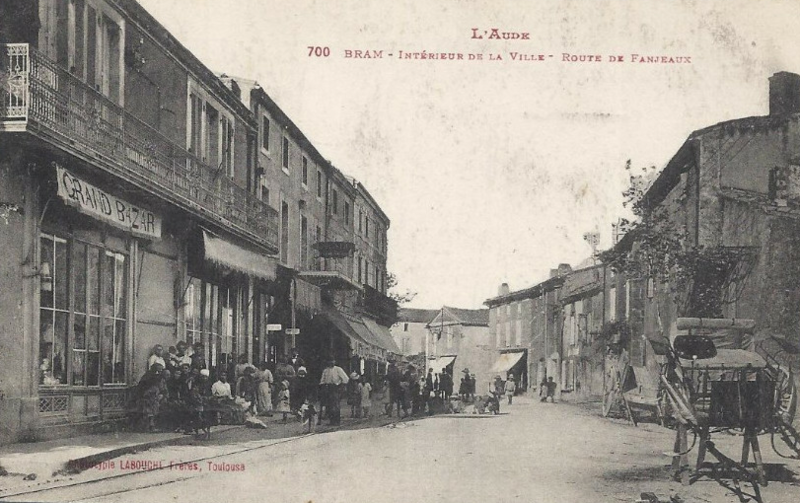 12. https://catharcountry.tumblr.com/post/172928586207/the-town-of-bram-aude-france, accessed on 3rd September 2018. 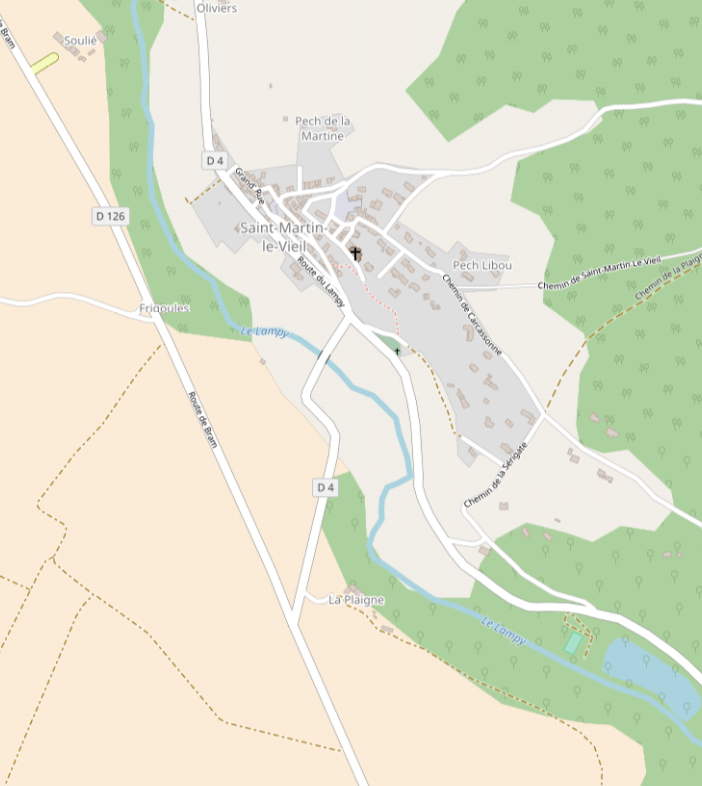 13. https://en.m.wikipedia.org/wiki/Saissac, accessed on 2nd September 2018. 14. http://www.catharcastles.info/saissac.php, accessed on 3rd September 2018. 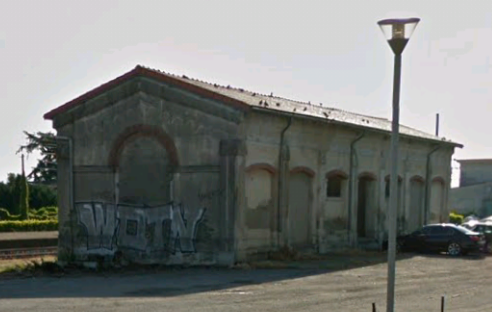 15. https://fr.m.wikipedia.org/wiki/Saint-Denis_(Aude), accessed on 3rd September 2018. 16. https://www.cparama.com/forum/fanjeaux-t273.html , accessed on 3rd September 2018. 17. https://www.google.co.uk/url?sa=t&source=web&rct=j&url=http://fanjeaux.com/wa_files/Tram.pdf&ved=2ahUKEwjghtK6sp7dAhXCBcAKHcrsAnMQFjABegQICBAB&usg=AOvVaw3wVxg8xf3nh0hfQV2KWiOC, accessed on 3rd September 2018. 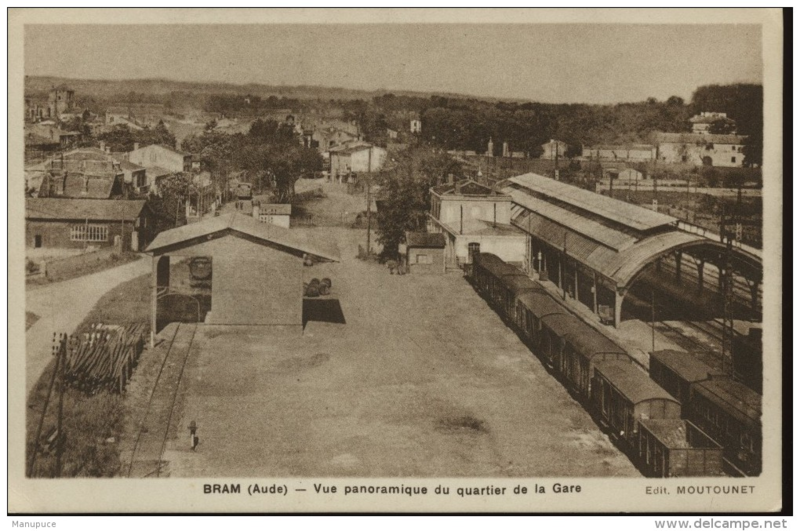 18. http://saissacdautrefois.e-monsite.com/blog/tramway-bram-saint-denis-aude.html, accessed on 3rd September 2018. 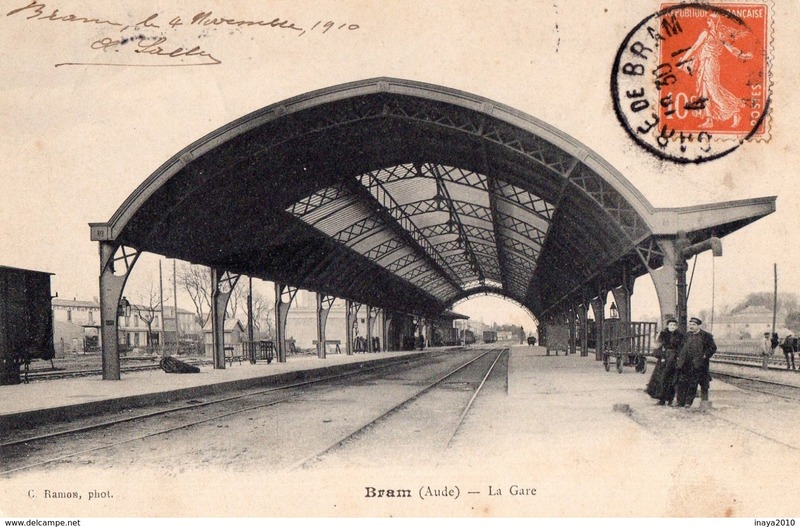 19. https://www.delcampe.net/fr/cartes-postales/europe/france/11-aude/bram?f=keyword:gare-bram, accessed on 3rd September 2018. 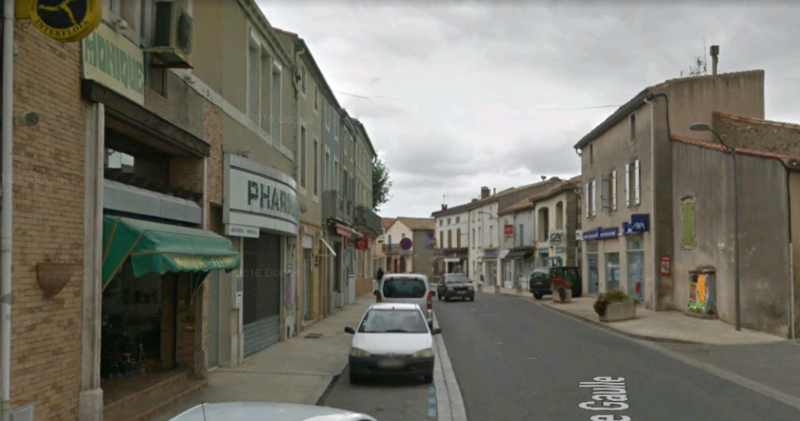 20. https://www.saintmartinlevieil.fr/patrimoine-et-tourisme/saint-martin-le-vieil-en-peinture, accessed on 5th September 2018. 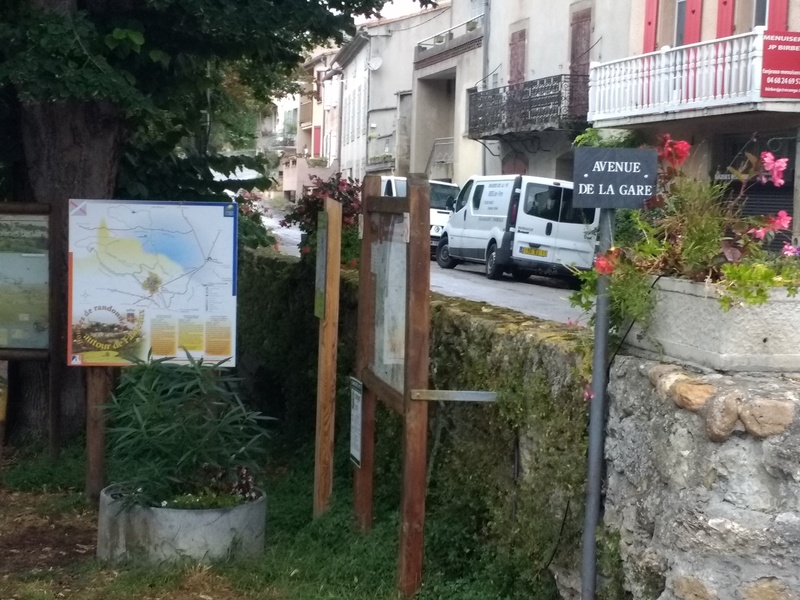 21. https://www.delcampe.net/fr/cartes-postales/europe/france/11-aude/autres-communes?f=lieux:pont, accessed on 5th September 2018. 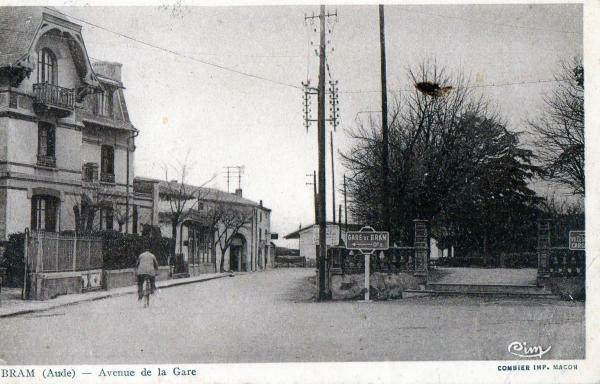 22. http://saissac.e-monsite.com/blog/gardons-la-memoire-intacte/l-ancienne-gare.html, accessed on 5th September 2018. 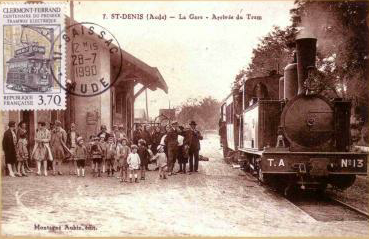 23. http://saintdenis-aude.fr, accessed on 5th September 2018. 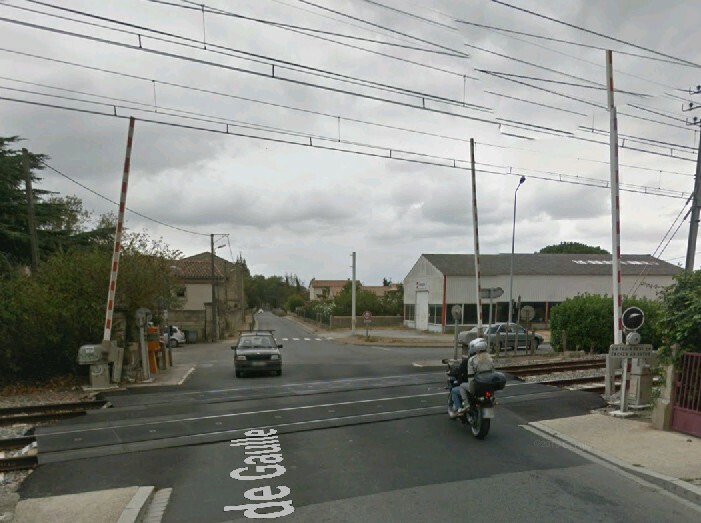 This entry was posted in Comment, Railways and Tramways of South-Western France on September 6, 2018 by rogerfarnworth.